My daughter, Rebekah, was just in an art show this past weekend, and we just returned from it. Art shows are a lot of fun and a lot of work. Of course, Rebekah does most of the work because she does all the painting. But there is a whole lot more that goes into an art show, like loading up, setting up, and taking down to name a few. So to support her, my husband Mike and I and two of her brothers helped her with all of that. We are glad to be a part of it all. We meet a lot of people which is great and seeing her sell art makes our day. As I was there I was thinking about all the things Mike and I have gotten involved with because we had 8 children.We learned through experience that if you want to stay on the same team as your children, then be a part of what they are interested in. Jump on board and learn as you go. A parent can usually see early on what their children’s interests are. Through the years my husband and I have learned all kinds of things just being a part of their activities. We participated in parades with a jump rope team, as well as traveled out of state with our daughter as a jumper and as the coach. We went to numerous soccer games and even learned the rules (although I never really understood the off sides rule). Mike even helped coach one year. We went to basketball games, swim meets, tennis matches and many baseball games. Mike Halloran with his sons Caleb, Isaac and Justin. 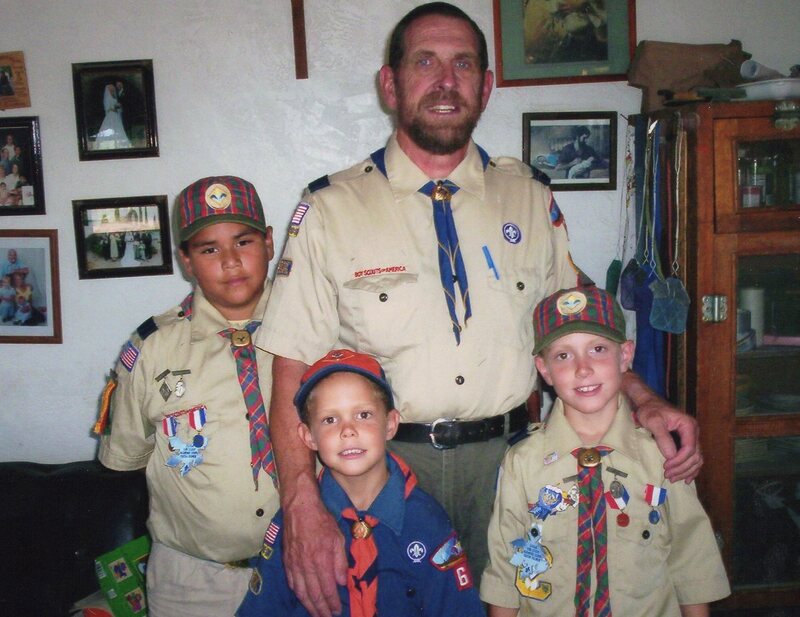 Three of our boys were in scouts and so my husband became a cub scout leader and later an assistant boy scout leader. He helped lead scouts in numerous merit badges and went to numerous scout summer camp with them. We went to piano recitals, jazz band concerts, horse competitions and the latest is art shows. Most of these activities we really didn’t know much about but we made it a point to learn as we went. We wanted to be there with them while we had them. Most importantly we wanted to be a part of their lives. I might add here that even though this sounds like a ton, remember we had 8 children. We did not allow them to do whatever they wanted. They were limited since we had community activities and because we live rural and we had to pay for gas to go to these activities. We tried to organize and coordinate so that while some had an activity, others did not. That also helped with not overcommitting. It’s been a wild ride but a fun one! My advice….make their interests your interests!